> Do we have apartheid in Australia? Apartheid came to Australia long before being used in South Africa. Is it still alive and well today? 'Apartheid' is an Afrikaans word meaning 'apartness' or 'separateness'. It describes a situation where an empowered dominant group submits a minority, usually a country's aboriginal people, using racial segregation involving political, legal, and economic discrimination. Apartheid is most often associated with the Republic of South Africa where it was introduced in 1948 and officially renounced in 1992. Few know it also happened in Australia. Racial segregation. Groups are, or the entire population is, divided by skin colour. This can include separate designated areas to live, work or be (spatial segregation). Classifications might be used, such as White, Black and Coloured based on physical characteristics. Less rights. The minority's political rights are reduced or removed completely. Opposition is suppressed. Regulations. Behaviour and communication of the minority group are regulated. Suppression. The government sets up elements to suppress aspects of the culture of the minority, for example in areas such as marriage, sexuality, jobs, wages or education. Violence and destruction. The minority group experiences overt or covert violence or racism. Their property or lands are destroyed. In 1901 one of Australia's first acts as a nation was to introduce the so-called White Australia policy to exclude non-Europeans from Australia. Under the policy Melanesian slaves and their families were forcibly repatriated , severing centuries-old family and commercial links between Aboriginal Australians and Indonesia. Desperately poor living conditions on fringe settlements. Missions on which white managers controlled every aspect of Aboriginal people's lives. White people convinced of their racial superiority. Exclusion of Aboriginal people from the basic amenities of a country town. Policies in states and territories refined apartheid after the White Australia policy was introduced. Aboriginal children 'painted white' to enter a swimming pool, 1965. Illustration: John Frith . Not allowed in swimming pools. Aboriginal children were not allowed to swim in the pool. The only opportunity to do so was by picking swimming as an elective in high school . Not allowed to town hall. The Walgett town council even passed a motion barring Aboriginal people from the baths and town hall. Not allowed at the footy oval. Not allowed in shopping malls. Security guards expelled Aboriginal people from shopping malls . Not allowed to the bowling club. Not allowed in the RSL. Karen Rutterman’s father George Rose, an ex-serviceman, was refused entry at the RSL almost his entire life. The attitude of the time was “if you’re black stand back, if you’re white you’re alright”. The RSL in Walgett barred Aboriginal ex-servicemen from membership. Not allowed to try on dresses in the store. Australian journalist Ray Martin, who also has Aboriginal heritage, remembers: "No question about it [having apartheid in Australia]. Aboriginal families herded into rough, town camps on the other side of the river, without electricity and with communal taps. Aboriginal people segregated on a Saturday night, squatting on the floor down the front of the local picture theatre. Aboriginal boys - who were the same age as me - being "hosed clean" by the lifeguards at the public baths, before they were allowed to jump in the pool." But Ray has even worse memories of Australia's apartheid. "Back then Bowraville had a hospital. It was a big building, only allowed for white people. On the side was a little room for the Aboriginal people, and it only had one bed in it. On a number of occasions my sister would get asthma and ended up in hospital. My mum and I used to go and visit her and we’d find my sister in one of those oxygen tents. Back then Aboriginal people weren't allowed in the hospital, I think it was only for kids. "A lot of our women folk who were having babies back then used to walk over the mountains to Bellingen Hospital [which accepted Aboriginal people], 50kms away. My husband’s mum walked over the mountains to have my husband back in 1941. My mother also walked the mountains to have my sister. "Then there’s St Mary’s. When I went to school at St Mary’s it had these great big buildings for the white children, with a large playground and a church. On the other side of a petitioned fence was a little shed. This was the school room for Aboriginal children, and we were not allowed to be friends with the white children – not even allowed to speak to them. "The church also had one section for the Aboriginal people and the rest for white people. "The police were also hard on our men folk, especially to older men. When they saw them standing in town doing nothing, they would either tell them to move home, or they would lock them up, especially if they had work to be done at the local police station. "Then we come to the famous picture theatre. Again this theatre was partitioned off for the white people, in their comfortable seats, looking straight at the screen. "We had to come in through the side gate, get our ticket at the little window, then walk down the side and up a steep set of stairs, only to sit on hard wooden fold up chairs and every one of us with our heads bent right back to look up at the screen. Some of us would lay on the cold, hard floor to watch the picture." Copied Africa apartheid from Australia? There is not much official talking about Australia lending its apartheid structures to Africa. But anecdotal evidence points to the White Australia policies being used as a blueprint for Africa's apartheid policies. According to Graham, the African government's experts came back in 1948, fell "in love with it" and implemented it "in full". Graham says this knowledge has been passed down from his grandfather. Graham is not the only one. Trevor Cook, who worked in politics, public policy and strategic communications for over 30 years and holds a doctorate in Australian politics at the University of Sydney, cites Janine Gertz, a Community Engagement Officer at James Cook University and friend of his. "South Africa's Apartheid system was modeled closely on Queensland's Aboriginal Protection Act (1897)," Gertz writes in a Facebook post . Australia introduced its White Australia policy with the ratification of the Immigration Restriction Act 1901. South Africa officially introduced apartheid much later, after the general election of 1948 , to be repealed in 1994. Pilger witnessed conditions in Africa that were similar to what he had seen in Australia. At Jay Creek, 45 kilometres west of Alice Springs in the Northern Territory, hundreds of Aboriginal people were corralled in conditions Pilger compared to those he had seen in Africa and India: One outside tap, no sanitation, rations consisting of starch and sugar, children with stick-thin legs and swollen bellies of malnutrition. It is not easy to recognise elements of apartheid in Australia. Often it takes outsiders to make the comparison. One such outsider is South African writer Sisonke Msimang who moved to Australia after spending years writing about and commenting on human rights, race relations and government accountability in South Africa. When the government intervened in the Northern Territory it also excluded Aboriginal people from the 1975 Racial Discrimination Act so it could pass laws (called 'special measures') that discriminated against them. Both the Liberal and Labor parties endorsed the change. International hotel giant Accor was forced in 2019 to launch an investigation after allegations that staff at one of its Australian hotels had been segregating Aboriginal guests in lower quality rooms. It was alleged that the Ibis Styles hotel in Alice Springs had directed staff to place guests from remote Aboriginal communities into designated "community rooms" which were dirty, and poorly maintained, with broken glass, leftover food, and discarded clothes found inside. The rooms cost the same as other, cleaner rooms which were assigned to non-Aboriginal guests. Tony Greer, Manager of the Apmere Mwerre Visitor Park in Alice Springs, concurs. 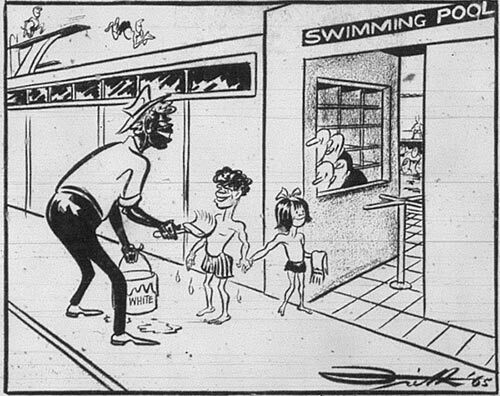 During the White Australia policy, segregation was imposed unofficially in public places such as theatres and swimming pools. It is shocking that it persists to this day, as Dr Waters knows. As any Aboriginal person and they will tell you that Aboriginal people are selectively targeted by police. People at Redfern, where the majority of Sydney's Aboriginal people live, were "far more likely to be searched than those at Central or Kings Cross stations". This was despite those searches being less likely to identify drugs. Passengers at Redfern Station were 6.5 times more likely to be searched than passengers at Central Station, the report found. With Australia's "law and order" and "tough on crime" approach, prison rates have exploded. Police target specifically Aboriginal people which makes their statistics even worse. No state or territory of Australia jailed Aboriginal males at a rate less than South Africa under apartheid. The closest was Tasmania at 1,169 per 100,000 population, 1.4 times South Africa's rate, the worst Western Australia at more than 8 times the rate of South Africa during apartheid. "Apartheid runs through Australian society"
"Within a short flight from Sydney, Indigenous people live the shortest of lives. Men are often dead before they reach 45. They die from Dickensian diseases, such as rheumatic heart disease. Children go blind from trachoma, and deaf from otitis media, diseases of poverty. A doctor told me, "I wanted to give a patient an anti-inflammatory for an infection that would have been preventable if living conditions were better, but I couldn't treat her because she didn't have enough food to eat and couldn't ingest the tablets. I feel sometimes as if I'm dealing with similar conditions as the English working class of the beginning of the industrial revolution."